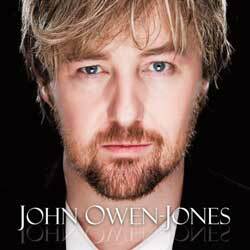 John Owen-Jones is a British musical theatre actor, best known for his portrayals of Jean Valjean in Les Misérables and The Phantom in The Phantom of the Opera in London’s West End. He has also played Valjean in the Broadway revival of Les Misérables and has recently been touring with the 25th Anniversary production of Les Miserables. He has played the role of The Phantom at Her Majesty’s Theatre in London's West End and also played the role on the Tour of Phantom of the Opera. He has a new album Unmasked which you can order from Amazon. Other theatre credits include Stephen Sondheim's A Little Night Music at the National Theatre along with Judi Dench, Patricia Hodge and Siân Phillips: The Ladies Paradise at the RNT Studio: The Pirates of Penzance and Much Ado About Nothing at Regent’s Park Open Air Theatre: The Boys from Syracuse: Herr Zeller in The Sound of Music and Gaylord Ravenal in Show Boat. Owen-Jones's work on television includes The Bill; The Life and Adventures of Nicholas Nickleby; The South Bank Show; The Margaret Williams Show; A Week in the West End and Record Breakers.